Well, that didn't take long: A mere four days after announcing the first major update for Windows Phone 8.1, the aptly named Windows Phone 8.1 Update is now available to users enrolled in Microsoft's developer preview. 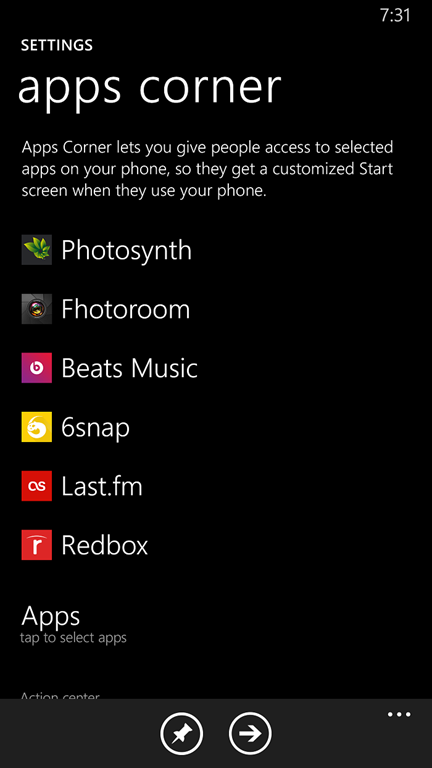 The sandboxed Apps Corner is a new feature in the Windows Phone 8.1 Update. Think of it as Kids Corner for business use. 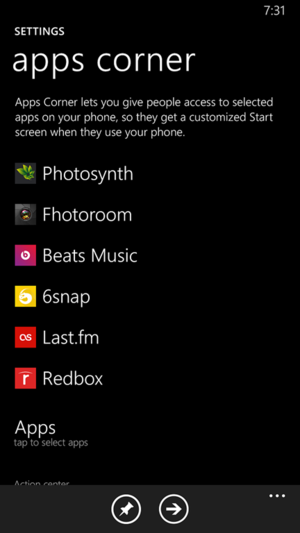 Windows Phone 8.1 Update is comprised mostly of minor features and updates, but ones that are nevertheless welcome. The update adds, among other things, folder support for WP's Live Tile'd Start screen, enhanced and geographically expanded integration for the Cortana virtual assistant (including "do an impersonation" requests), and a better mobile browsing experience with Internet Explorer 11. It also includes new business-friendly features like segregated, sandboxed apps and the ability to configure VPN settings when you're connected to a public Wi-Fi hotspot (finally). Don't expect this update to hit your phone too soon, however. Most Windows Phones users have yet to receive even the original Windows Phone 8.1 release, which added Cortana, a much-needed notification center, and a slew of other new features. That's where the beauty of Microsoft's developer preview comes in. Anyone can register as a developer in mere minutes, which enables you to receive new Windows Phone updates as soon as they go live rather than waiting for your carrier to complete tedious network validation procedures that delay the actual public over-the-air release of updates—a process that can take weeks or even months. Perhaps tellingly, a July, 2014 report released by Windows app ad network provider AdDuplex revealed that 11.9 percent of all Windows Phones connecting to its network run Windows Phone 8.1. That's a shockingly high percentage for an operating system that is available only in a small handful of low-end Lumia handsets, very few mainstream devices (yet), and phones configured in developer preview mode. Interested in giving the new features a whirl—and don't mind the inherent risk involved with running beta code on your phone? Here's how to enable the Windows Phone 8.1 developer preview right now.